A couple of weeks ago writer Carrie Patten made a visit to my studio, we talked for an hour or so and she looked through work in progress and pieces ready to show. Her reflections have allowed me to consider my work in new ways and appreciate the work contained within my studio and what lies beyond its door. Carrie Patten is a writer based in Norfolk. She is a graduate of Norwich School of Art and has recently completed Creative Writing studies with The Open University. Her work has been appeared in Ink Sweat and Tears and Lighthouse 7, published by Gatehouse Press. The approach to her studio is poppies in the rubble. Amongst the broken brick, Lucozade bottles and discarded cans, sit abandoned office blocks with the wasteland no-mans-land between. Debris and concrete waiting. I guess they’re waiting for development. There’s a code. An ‘out’ flick ‘in’ flick sign to shift. A metal stair-case. Her strip of a studio towards the front of the building is in face-off to the semi-industrial-urban, its back an open view to the workshop. A velux offers a tilted view to the outside, tipping inside the blue sound of sirens, the glass a semi-transparent which opens to the linear outlook of empty steel and glass offices in the city beyond. The cherry pickers and cranes are assembling components of the new, as old buildings on the skyline are slowly de-constructed. Her circular fan blows the city inwards on early June heat, across the heads of poppies on the narrow strip. 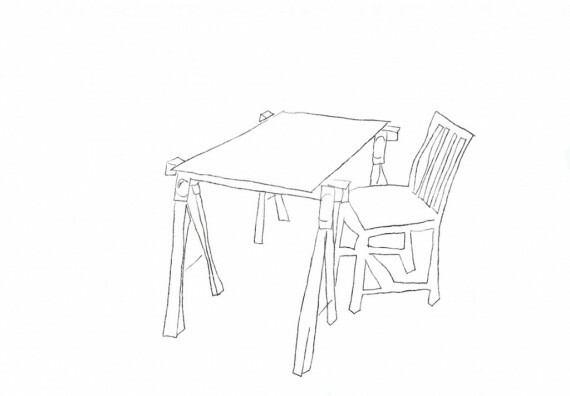 Her linear drawings are laid out along the desk. She uses a light-box to draw in a process of graphic selection. Her matt black marks are stark against white paper and their opacity on translucent acetate invites layering of one image upon another. I become preoccupied with the layering of them. Although some cross-hatching appears, there is a diagrammatical purity which renders form largely devoid of shadowing detail. I work my way along the surface of images whilst we talk of a time of transition. We talk of de-constructing and re-constructing the self. We talk about the effect of moving forward and of the opportunities we are creating. We talk of Draftsman’s tools, of recurrent circles and french curves. Templates. Apertures through which to view and from which form emerges. We talk of Spirographs with cogs that move and touch with teeth that engage their gears, holding young ideas in place. We talk of how some things don’t appear right away, how your eyes take time to discern. Sometimes her drawings present no relationship to a depth of field, so your eyes pick out the close detail in order to understand the bigger picture. She says that we tend to focus ostensibly on the face, on the things that we are programmed to recognise. Form builds in relation to that. Cut-away images play with a sense of spatial ordering, allowing restricted views to the layers beneath. Other images make reference to perspective analogue, oculus points and coordinate axes. Top views perplex a sense of deciphering body language, cataloguing human poses in their essence. They are creating metaphors, communicating visual perspectives that invite subjective interaction. They are architectural and engineered. She is a drafter, de-coding form and bridging the gap between information and delivery. I’m wondering to what degree she is influenced by her environment? Perhaps oftentimes it is by a process of osmosis. Above the shop floor, amongst the urban-under-construction and sandwiched between the semi-derelict light industrial space and the developing urban city-scape, talk of exhibiting finished work in the context of an architectural environment feels wholly appropriate. It is a place that provides her with a marriage of industry and art. It is poppies in the rubble.